Tiger Yaltangki, Malpa Wiru (Good Friends), 2018. Synthetic polymer paint on linen, 152 x 122cm. Courtesy: the artist, Iwantja Arts, SA and Alcaston Gallery, Melbourne. Alcaston Gallery presents new paintings and limited-edition prints by artist Tiger Yaltangki in his second solo exhibition at Alcaston Gallery, Malpa Wiru (Good Friends). With his bold, idiosyncratic style and vibrant use of colour, Yaltangki creates exciting artworks that allude to an avid appreciation for popular culture and an innate understanding of his country in the Anangu Pitjantjatjara Yankunyjatjara (APY) Lands, north-west of South Australia. 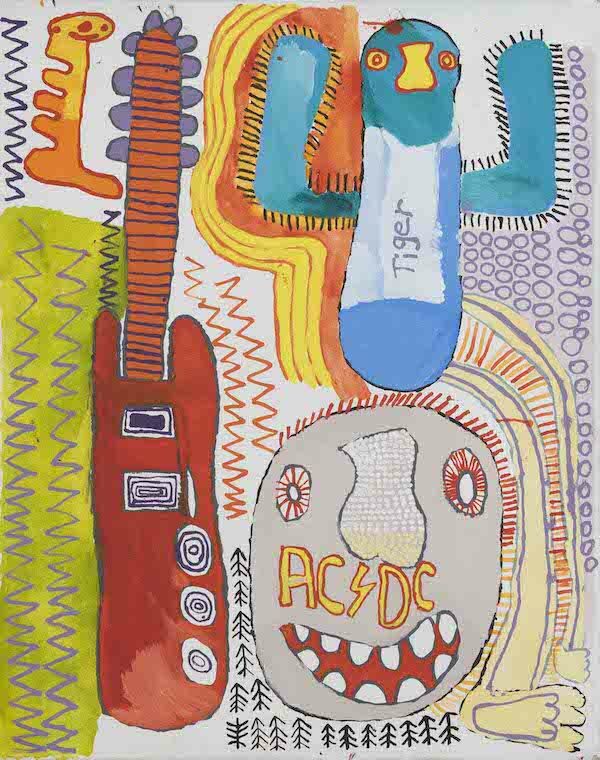 Yaltangki takes inspiration from his favourite science fiction films and television shows, such as The Mighty Boosh and Dr Who, as well as influential rock and roll bands like AC/DC in the creation of his Malpa Wiru (good friends).